The cabins BETWEEN EARTH AND SKY are located in the heart of the forest in a natural setting with stunning views of the massif of Mont-Blanc. You can relax by listening to the birds singing, or just watch the wildlife from the treetops. 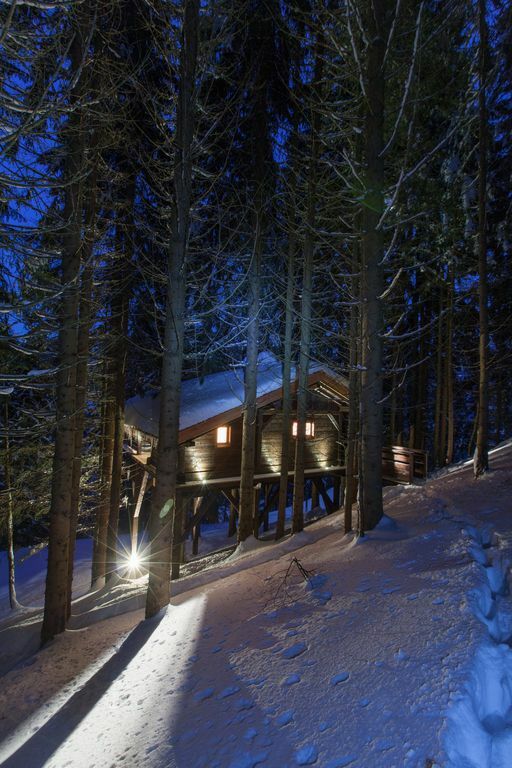 The cabins have a bed 2 people 160x200, a bathroom including shower and the sink dry toilets, a dining area, a lounge area and private terrace overlooking Mont-Blanc. The SAUNA with its bubble offers an exceptional view among the branches, and the natural wood Jacuzzi perched 5 meters above the ground will make you let go the one evening. Hairdryer, linen and household linen, towels, bath mats, bathrobes, slipper, organic cosmetics, toaster, kettle, coffee maker, dishes. De très bons moments passés dans ce lieu exceptionnel. La cabane est superbe et mérite le détour.